SEINAN is committed as ALL SEINAN, to become a company, which industry, life and the future regard as essential for them. Based on this corporate identity, we make three promises to our society. We offer appropriate recycling for each community with our expertise based on various experiences. High mobility is one of our advantages. Our abundant transport and cargo-handling machinery with sufficient knowledge makes it possible to choose out the best method for each area and offer high-quality speed with accuracy and precision. It is our biggest pleasure to see people feel happy with our work. 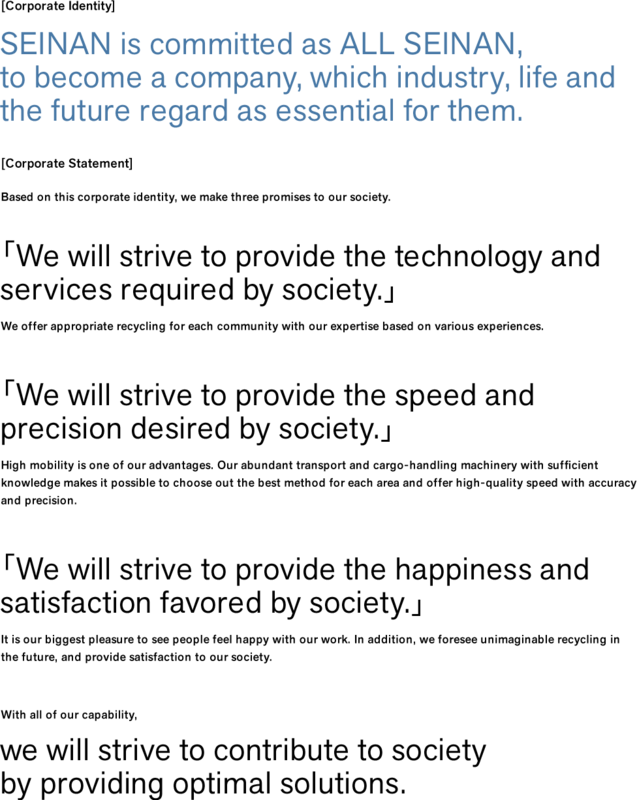 In addition, we foresee unimaginable recycling in the future, and provide satisfaction to our society. we will strive to contribute to society by providing optimal solutions. Private business established as Ando Firm in Omachi, Hirosaki City. Reorganization implemented to create a stock company called SEINAN Corporation. SEINAN Corporation Namioka Plant opened and chosen as a designated agent by Mitsui Co., Ltd.
SEINAN Corporation Akita Branch opened. Industrial waste disposal license obtained by SEINAN Corporation (Aomori Prefecture). Shredding plant put into operation at SEINAN Corporation Namioka Plant. Headquarters moved to Watoku Industrial Complex in Hirosaki City. Aluminum melting furnace put into operation. SEINAN Corporation Hachinohe Branch opened. Guillotine shear put into operation. Pre-shredder put into operation at SEINAN Corporation Namioka Plant. Akita Rinko Scrap Corporation established (separate from SEINAN Corporation). Akita Rionko Scrap Corporation Noshiro Plant opened. SEINAN Corporation Morioka Branch opened. SEINAN Corporation Sendai Branch opened. Shredding plant put into operation. Melting reverberatory furnace put into operation at SEINAN Corporation Namioka Plant. Shredding plants put into operation at Akita Rinko Scrap Corporation. Shredding plants put into operation at SEINAN Corporation Hachinohe Branch Hachinohe Plant. Machine-related patent secured (Patent 1990-25690). Aluminum rotary furnace put into operation at SEINAN Corporation Hirosaki Headquarters Plant. SEINAN Corporation Aomori Branch opened. Heavy Media Separation plant put into operation at SEINAN Corporation Hirosaki Headquarters Plant. Company name was changed from "Akita Rinko Scrap Corporation" to "Akita Rinko Corporation". "SEINAN Corporation Koriyama Branch Koriyama Plant opened. Shredding plant and Heavy Media Separation plant put into operation. Industrial waste disposal license obtained by Akita Rinko Corporation　(Akita Prefecture). Further industrial waste disposal licenses obtained by SEINAN Corporation (Iwate prefecture). Aomori Renewable Energy Recycling Corporation (Aomori RER) established. Industrial waste disposal license obtained by SEINAN Corporation (Sendai). SEINAN Corporation Hirosaki Branch Inakadate Plant opened. Non-ferrous metal hand picking line put into operation. Industrial waste disposal license obtained by SEINAN Corporation (Fukushima Prefecture). Industrial waste disposal license obtained by Aomori RER (Aomori Prefecture). Gasification melting power plant put into operation at Aomori RER. SEINAN Corporation Aomori Branch Aomori Plant opened. Shredding plant and Heavy Media Separation plant put into operation. Industrial Technology Center (controlled final landfill site) opened. ECO Plaza Aomori opened by Aomori RER in Aomori City. 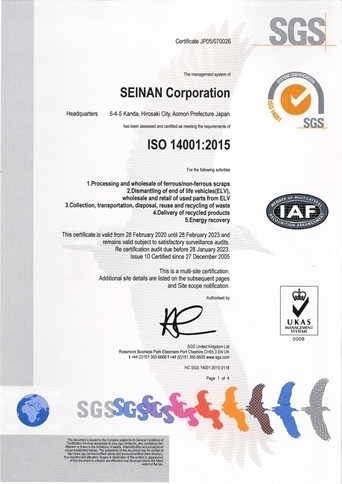 SEINAN Group (5 corporations, 14 offices) obtained ISO14001 certification. Industrial Technology Center was absorbed by SEINAN Corporation. SEINAN Express Corporation Aomori Office opened. SEINAN Corporation Morioka Branch ULTREC Yahaba opened. SEINAN Corporation Hirosaki Branch ULTREC Aomori opened. SEINAN Corporation Sakata Branch Sakata Plant opened. Shredding plant put into operation. SEINAN Corporation Sakata Branch ULTREC Sakata opened. Industrial waste disposal license obtained by SEINAN Corporation (Yamagata Prefecture). SEINAN Corporation Aomori Branch Plastic Recycling Plant put into operation. Recycling business (PET bottle) started. SEINAN Corporation Sendai Branch Shiogama Plant opened. SEINAN Corporation Sendai Branch ULTREC Shiogama opened. SEINAN Corporation Hachinohe Branch ULTREC Hachinohe opened. Industrial waste disposal license obtained by SEINAN Corporation (Miyagi Prefecture). Recycling business (Plastic container and packaging) started. SEINAN Corporation Sakata Branch Tendo Plant and ULTREC Tendo opened. Akita Rinko was absorbed by SEINAN Corporation. SEINAN Corporation Akita Branch Akita-Rinko Plant opened. SEINAN Corporation Akita Branch Noshiro Plant opened. SEINAN Corporation Aomori Branch Plastic Recycling Plant obtained ISO9001 certification. 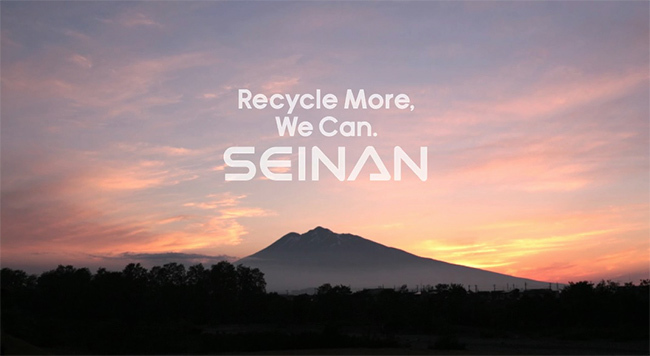 Company name was changed from "Aomori Renewable Energy Recycling Corporation" to "SEINAN RER Corporation". The company’s regulatory information is disclosed in PDF file format. Adobe Reader must be installed to view it. SEINAN Group as an enterprise has grown significantly with recycling as its main business. This was achieved after a period of high economic growth coupled with the enforcement of various related environmental laws since the 1990s. With the Lehman collapse in 2008, global prices of resource materials fell and interest in recycling went down. This was further aggravated by the slow economic growth rate in China and in Japan where birthrate is declining and population is aging. Keep environmental load generation to the minimum through our activities. Expand recycling business into a “sustainable business” which contributes to improved environmental conditions and economic development. Promote new business undertakings to realize recycling as necessary for the future society. Continue to be trusted by local communities and the society, in general, and to promote that functions and concepts of recycling are important for community and society. We aim to continue working to provide products which satisfy every customer, introduce “advanced technology” through optimal production methods and efficient production and management system. Continue to provide speedy and quality customer service. Produce products that can be used in a wide range of applications or uses. Make products which conform to international standards. Establish “SEINAN Brand” with customers are the top priority in mind. By recycling waste plastic etc.